Anglers who fish in Sherburne, Stearns and Wright counties benefit from the management, habitat and oversight work of the Minnesota Department of Natural Resources' Sauk Rapids area fisheries staff. Area Fisheries Supervisor Joe Stewig and a staff of three full-time employees manage 150 fishing lakes and 260 miles of rivers and streams. Th ese waters include popular fishing destinations such as Big Watab, the Sauk River Chain of Lakes, Sugar Lake and the Mississippi River south of St. Cloud. 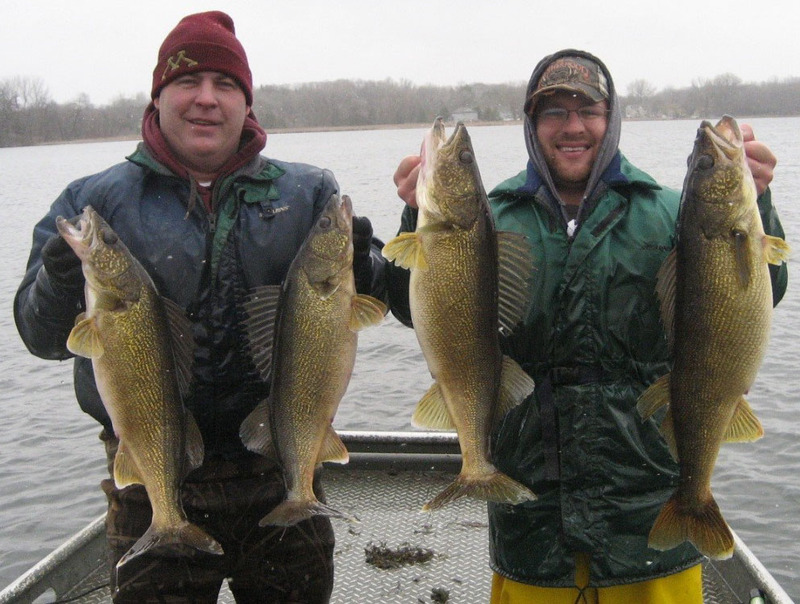 Sauk Rapids Area staff showing off four solid walleyes captured during an ice out assessment on a popular local lake. Manage the fisheries of 150 lakes, 60 miles of the Mississippi River and 200 miles of moderate size rivers such as the North Fork of the Crow, Sauk and Elk and evaluate lakes and rivers with special or experimental fishing regulations. Stock 40 area lakes with walleye, two lakes with muskellunge and one lake with trout. Conduct creel surveys to stay in touch with the angling public, monitor angler expectations and gauge effectiveness of current management strategies. Conduct research for a smallmouth bass tagging study and population estimates for northern pike, walleye and muskellunge. Survey and document aquatic vegetation and make conservation recommendations. Manage and develop existing shore fishing sites to provide better angling access. Provide outreach to schools, watershed districts, lake associations and rural communities. Provide area website with in-depth and current fisheries information. Welcome to the Sauk Rapids Fisheries Management Area. 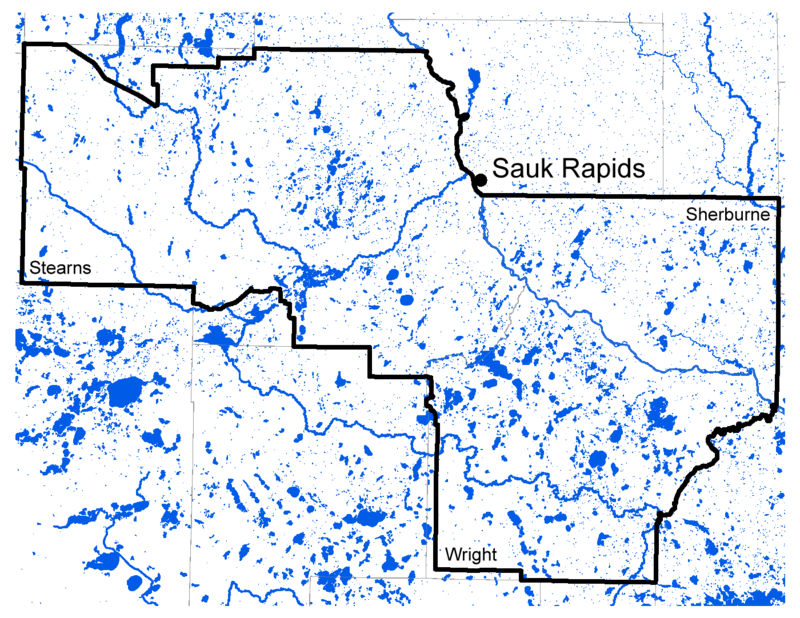 Our office manages the lakes, rivers, and streams in Wright, Stearns, and Sherburne Counties in Central Minnesota. We actively manage the fisheries on 150 lakes, 60 miles of the Mississippi River, over 200 miles of warm water rivers, one trout lake, and five trout streams. Our work area is in the heart of bass/bluegill territory in central MN; furthermore, the Mississippi River from St. Cloud to Anoka is home to one of the greatest Smallmouth Bass fisheries in the state! In addition to Largemouth and Smallmouth Bass and Bluegill, there are excellent opportunities to target Walleye, Northern Pike, Muskellunge, Black Crappie, Brook Trout, Channel Catfish, and Common Carp. Three state record fish have come from this area including White Crappie, Greater Redhorse, and Common Carp. On this site you can find information about recent surveys, fish stockings, special regulations, and other useful information. If you have any questions feel free to e-mail or call in.